They have had a super-busy 2018 - four North American tours, during which they visited Colorado, New Mexico, Vermont, Massachusetts, Connecticut, New York, New Jersey, Maryland, Illinois, Missouri and Ontario, a month-long tour of New Zealand, tours in Ireland, the UK, Italy and France, several festival performances - Temple Bar Tradfest, Dublin, Celtic Festival of Southern Maryland, Spring Rain Festival, Ontario, Gower Folk Festival, Wales, Old Songs Festival, NY, International Festival for Irish Harp,Termonfechin, Co. Louth, Catskills Irish Arts Week, NY, Festival on the Green, Middlebury, VT, Somerset Folk Harp Festival, NJ, Fiddler's Green International Festival, Rostrevor, Co Down, Beppe Gambetta Guitar Summit, Santa Margherita Ligure, Italy, Kelso Folk Festival, Scotland and Wellington Folk Festival, New Zealand - and their sixth annual Christmas tour in the UK. In addition, this year's Cork Folk Festival featured the premiere on October 3rd of a composition entitled "Corcach: A Journey" by Máire, Nollaig and Mairéad The Casey Sisters), specially-commissioned by the festival for its 40th anniversary. Chris and Máire were delighted to be featured on the first programme of the "Tradfest TG4" TV series, broadcast November 25 on TG4. You can watch it on catchup TV here. They were interviewed by Tom Lane for his BBC Radio Lincolnshire "Thursday Night Folk" programme, broadcast Thursday December 13th. You can listen to it on catchup here. An interview with them appeared in the Spalding Guardian (Lincolnshire) on December 17th. They had a fun autumn 2017 - a fortnight touring in Ireland with Máire's sisters, a six-week duo tour in Canada and the USA (Ontario, Québec, Arkansas, Tennessee, Louisiana, Mississippi, Alabama and Florida), followed by a duo Christmas tour in the UK. .
On June 2th 2017 Máire was thrilled to lead over 70 harpers in playing her composition, Harps in Bloom (Termonfechin Times), at the 32nd International Festival for Irish Harp (An Chúirt Chruitireachta) held in Termonfechin, Co. Louth - such an exciting and powerful sound! The performance was televised by RTÉ and broadcast on three news programmes and on RTÉ 2's news2day programme that day. Here's the programme - the harp segment starts right away. A month-long tour of New Zealand (sponsored by Culture Ireland and incorporating a headlining appearance at Whare Flat Festival) in January this year (2017) and subsequent bunch of UK concerts was followed by performances by Máire at Ireland's Gathering Festival and Ballymaloe Grainstore with the Casey Sisters. She and Chris then headed off to Dallas to perform as one of the headlining acts at the North Texas Irish Festival before returning to this side of the pond to do some concerts sponsored by the Arts Council of Wales, followed by a really good fun weekend playing at the Costa del Folk Festival in Ibiza (Spain)! Chris also had a great time teaching and performing at Roberto dalla Vecchia's Guitar Workshop week in Vicenza (Italy), as did Máire teaching and performing at Cairde na Cruite's International Festival for Irish Harp (An Chúirt Chruitireachta), the Willie Clancy Summer School and Music Generation Laois's Traditional Music Summer Camp. In the lead-up to the Casey Sisters' concert at the Ballymaloe Grainstore, Máire was interviewed by Cork's Evening Echo newspaper (click here to read) and all three sisters were interviewed by one of Ireland's national daily newspapers, The Irish Examiner (click here to read). Here's a video of their performance at the Skibbereen Arts Festival. 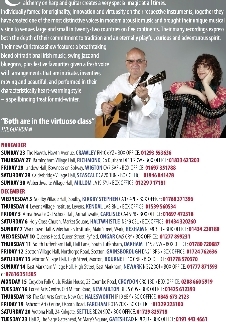 Chris and Máire have had a wonderful year so far (details here), and are looking forward to touring this autumn in the UK, Ireland, the USA and Canada! Recent Irish TV programmes featuring Máire and Chris still available on the TG4 server include Part I of the TV programme "Mná an Cheoil" (Women in traditional Music) on TG4, Máire's live TV performance with Anne-Marie O'Farrell and Cormac de Barra on “Gradam Ceoil TG4 2016” and their duo performance on "Hup" on TG4. "Celtic Connections", the US public radio programme hosted by Bryan Kelso Crow for WSIU and widely syndicated (to stations in Arizona, Arkansas, Colorado, Illinois, Iowa, Kansas, Louisiana, Maryland, Minnesota, Missouri, New Mexico, Oklahoma, Pennsylvania and Texas), broadcast a whole hour-long show about Máire and Chris on 10 November 2016. It incorporated a lengthy interview with them, an overview of their career and a selection of tracks from their recordings. The programme is no longer on the WSIU server, but information about it can still be accessed here and a playlist can be accessed here. 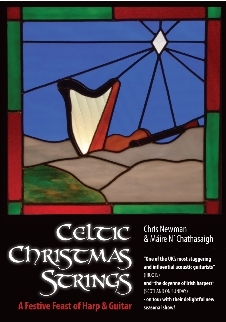 In 2015 / 2016 Máire and Chris toured in Australia (twice), the USA (four times), Canada, Italy, Denmark, Sweden and Ireland in addition to their UK work (which included their annual hugely-enjoyable Celtic Christmas Strings tours) and gave thirty-seven festival performances. Other notable events in that period were the award to Máire of Female Musician of the Year in the Live Ireland Music Awards 2016 and in the Chicago Irish American News Top TIR Awards (details here) and four TV performances. "At the end of this meeting of arguably Irish music’s foremost family group there’s a suite giving a musical representation of their home town, Bandon in West Cork’s history. It could just as well be a depiction of the Casey Sisters themselves, having grown up as the only traditional music players in town, returning to show the mastery that’s given them global reputations. Thumbing of noses doesn’t sit with the warmth and intimacy that permeates Sibling Revelry, though. This is high-end music-making, virtuosic yet presented in a way that puts the music first, the arrangements geared towards clear melodicism and rich, flowing, soulful expression. Máire (harp, piano, keyboard), Nollaig (fiddle, viola, whistle) and Mairéad (fiddle, whistle, flute) complement each other brilliantly on beautiful airs and superbly measured tune sets and the latter pair’s singing – Nollaig’s slightly wary-sounding on The Bonnie Boy in Blue; Mairéad’s sweet and lovely on A Dhroimeann Donn Dílis – emphasises the sheer depth of feeling they have for the Irish tradition." "Intimacy and intuition are at the heart of this radiant collection. Máire Ní Chathasaigh, Nollaig Casey and Mairéad Ní Chathasaigh are already highly regarded, but together, the sum of their parts reveals a generosity of spirit, a shared delight in the tunes and an appetite for forensic musical excavations. Máire’s harp is at its subtle best on O’Carolan’s Katherine O’More, its sotto voce conversation with the fiddle giving full voice to the tune’s delicacies. The Bandonbridge Suite, composed by the sisters, is a playful, meditative and sweeping reflection on a part of the country seldom referenced in the traditional music canon. Máire’s vocals bring a rich dimension and the unveiling of Connamara, a previously unpublished tune from the Bunting collection, is a further treat." Review by Martin Chilton. Now in his list of best folk albums of 2015! "There are times when it seems like certain families got more than their fair share of musical genes, when a whole load of them can display talent of the highest order. So it is for the three sisters Nollaig Casey (vocals, fiddle, viola, tin whistle), Máire Ní Chathasaigh (Irish harp, piano, keyboards) and Mairéad Ní Chathasaigh (vocals, fiddle, tin whistle, low flute). All three are known for their outstanding work in their respective interpretations of Irish music and song, but this is their first recording as a band of sisters, accompanied by Arty McGlynn on guitar and Chris Newman on bass. Máire has rightly been described as “the doyenne of Irish harp players”, taking the instrument in new directions and acting as a generational influence. Nollaig has sung and played fiddle solo and with more musicians than you could list on the back of a ream of envelopes. Mairéad is a singer whose depth of knowledge and understanding of the Irish traditions is peerless. And they all are award-winning multi-instrumentalists as well. Not bad going for one family! They have been so busy with their individual careers that you maybe can understand why they’ve not got together before, but after listening to this release, the only question is: “what took you so long?” The album brings together traditional songs and tunes, with a six-part Bandonbridge Suite, co-authored by the three siblings to finish off the CD. This comes at the end of a stunning mixture of songs which are as clearly sung as any I’ve heard, and the playing throughout is a masterclass in allowing restraint in playing to demonstrate the complexities of the tunes. The punning title is well-chosen, as there is no rivalry here, rather musical co-operation in which none dominates and all contribute evenly. A superb album." "Now who had the brainwave to bring together these three musical sisters for an album of truly joyous music-making? … You’ll know the ladies individually, of course, as front-runners in their respective fields of musical endeavour: Nollaig Casey as fiddler and singer (she also plays viola and tin-whistle), Máire Ní Chathasaigh as harpist extraordinaire (also piano and keyboard player), and Máiread Ní Chathasaigh as singer and fiddler (who also plays tin-whistle and low flute). Unbelievably, the deliciously-titled Sibling Revelry is the sisters’ first recording together (mind you, they’ve all had busy and fruitful individual careers), and yet the teaming here reveals a further inspired level of musicianship that’s beyond the intuitive. They excel on their respective instruments, sure, but they also possess an innate grasp of internal dynamics (whereby felicities of balance are keenly observed) and an uncanny ability to listen to each other and respond in kind, rejoicing in spontaneity of expression. The material chosen for this album is thoughtfully and impeccably arranged, and ideally sequenced for optimum listening pleasure. It comprises mainly instrumental items, with just three songs carefully interleaved; of these, two are sung by Mairéad and one by Nollaig, and both singers display both a constant purity of tone and an unassumingly accomplished clarity of diction. The instrumental repertoire is an enterprising selection of traditional tunes, largely from manuscript collections, with one by O’Carolan and one by Máire herself, while the ten-minute closing track, the six-part Bandonbridge Suite, has individual sections composed by individual sisters. Good use is made of the possibilities of both arrangement and studio facilities for imaginative presentation; sometimes, Nollaig doubles her fiddle parts or else creates a mini-string-section by adding the darker timbre of viola to the mix, while the colours of tin-whistle and low flute add further variety to five of the selections and Máire’s harpistry is as skilled and scintillating as ever. Arty McGlynn’s guitar accompanies deftly on three tracks, including the final movement of the Suite, and Chris Newman plays bass on one of the songs. Even so, one of the album’s standout tracks is Nollaig’s pindrop solo performance on her adaptation of Lament For General Monroe. The entire album represents a glorious and wholly delectable celebration of expertise in sibling musicianship of the highest order, and proves a life-affirming experience, a joy from start to finish." "The intriguingly titled ‘Sibling Revelry’, the debut album from the class act that is The Casey Sisters, exudes the highest levels of talented musicianship and without doubt manifest skill. The word ‘expressive’ could easily sum up this album as the sisters pour so much of themselves into the music it talks to the listener on so many levels. The lightest of airs rub shoulders with ‘soul-touching’ songs and ‘step-inducing’ dance tunes to conjure an experience that will simply sweep you away into its enveloping embrace. From the first moments, with the entrancing energy of ‘The Humours Of Castlebernard/ From Shore To Shore’ through the soft gentleness of ‘Katherine O’More’ to the haunting ‘A Dhroimeann Donn Dílis’ this album will hold you rapt. Were it possible to pick favourites from this album because the whole is so good and everyone will find their own preferences, then for me the dramatic ‘Lament For General Monroe’, their wholly impressive take on ‘Dark Lochnagar’ and impressive expanse of the specially composed, six-part ‘The Bandonbridge Suite’ are the ones that I lean towards the most." An hour-long interview with all three sisters by Ellen Cranitch was broadcast on "Grace Notes" on RTÉ Lyric FM on Thursday October 8 and is now available to listen to on the RTÉ Player - click here, then click “Grace Notes Thursday 8 October 2015” and then “Listen”..
Further nice reviews are shortly to be published (we'll post them here as soon as we can scan them!) The CD has already been played on a number of BBC radio stations (including BBC Radio nan Gaidheal, where it is "Caithreim Ciúil"s Album of the Week this week), several NPR stations in the USA (including WGBH, KRVS, KUAR), on stations in Germany, France and Italy and on RTÉ Lyric FM, Raidio na Gaeltachta, Clare FM, Shannonside Radio, Midwest Radio, Tipp FM and LMFM - Máire was interviewed on LMFM about the album. After a couple of lovely festivals in atmospheric and historic locations in Italy in late July, Chris and Máire headed straight into mixing Sibling Revelry. It was mastered and manufactured in time for the sisters' concert at the 3rd Harp and Heritage Weekend at the Walled Town Festival in their native town of Bandon, Co. Cork. Just prior to the Italian trip, Máire had spent a fortnight teaching and performing at the 30th International Festival for Irish Harp at An Grianán, Termonfechin, Co. Louth (where she also performed at the gala concert with The Heartstring Quartet) and Scoil Samhraidh Willie Clancy in Miltown Malbay, Co. Clare. The Irish events were preceded by a tour of Denmark with Chris, Máire's sister, fiddle-player and singer Nollaig Casey and guitarist Arty McGlynn (as The Heartstring Quartet), during which they performed at Halkaer Festival. Máire and Chris had spent April - May touring as a duo on the East Coast of the USA. Less than two weeks before the start of that tour at the Celtic Festival of Southern Maryland, they had returned from a seven-week quartet tour of Australia in February - April which included appearances at Perth International Festival, Port Fairy Folk Festival, Blue Mountains Music Festival, the National Folk Festival, Cobargo Folk Festival and Deloraine StringFest (see here for details) - and in that period managed to fit in concerts at the Edinburgh Harp Festival, Coquetdale Music Trust and Lichfield Arts Centre. Here's a link to an interview with Máire in The Herald Scotland on 8 April, 2015, prior to the Edinburgh Harp Festival performance. Here's an article about the duo in the May 6 issue of New York City's Irish Voice newspaper. The quartet's second album, Heartstring Sessions 2, was recorded in January and manufactured in time for the Australian tour! The CD will be released in Europe or the US soon - we'll keep you posted. Máire and Chris had a wonderful time on their 21-date Celtic Christmas Strings tour of the UK in November / December (flyer on the right) - eight of the concerts were sold out, which was very gratifying, and the whole experience was fantastically good fun! They've posted photos taken on the tour, together with photos of their autumn trips to Italy and Sweden, on their Facebook Page. Máire and her two fiddle-playing and singing sisters Nollaig and Mairéad performed and taught at the 3rd Harp Weekend at Bandon Walled Town Festival, held in their home town of Bandon, Co. Cork on August 30 - 31. Their concert on August 30th (to a capacity audience in St Peter's Church) included the première of their specially-composed Bandonbridge Suite - a musical representation of the history of the town - and the launch of their new CD "Sibling Revelry". Here's a video clip of Máire and Nollaig playing together. Máire and Chris had a wonderful time on their second 21-date Celtic Christmas Strings tour of the UK in November / December (flyer on the right) - eight of the concerts were sold out, which was very gratifying, and the whole experience was fantastically good fun! They've posted photos taken on the tour, together with photos of their autumn trips to Italy and Sweden, on their Facebook Page. Máire and her two fiddle-playing and singing sisters Nollaig and Mairéad performed and taught at the 2nd Harp Weekend at Bandon Walled Town Festival, held in their home town of Bandon, Co. Cork on August 30 - 31. Their concert on August 30th (to a capacity audience in St Peter's Church) included the première of their specially-composed Bandonbridge Suite - a musical representation of the history of the town - and their new CD will be released at the 2015 festival. Here's a video clip of Máire and Nollaig playing together.